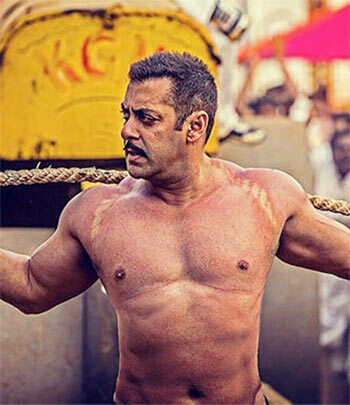 Director Ali Abbas Zafar relies solely on Salman Khan's drawing power and offers nothing novel in terms of storytelling, feels Sukanya Verma. A title signifying superiority or significance? Check. Leads a premise that involves surpassing every obstacle? Check. Batters beefcakes in all colours and sizes as if just waiting to be struck? Check. Indulges in tomfoolery to woo the girl? Check. Breaks into ludicrous dance moves. Check. Sounds off swaggering philosophy against a self-congratulatory theme song? Check. Takes off his shirt? CHECK. Make no mistake. Sultan is a classic Salman Khan vehicle in the skin of a sports drama imagining itself to be more profound than it really is. Doesn’t mean it’s not engaging, a lot of it is but, despite the possibilities, writer-director Ali Abbas Zafar relies solely on its main star’s drawing power and offers nothing novel in terms of storytelling. Occasionally, Zafar gets off the formulaic route to reveal the progressive outlook of his protagonists only to dilute whatever impact it generates by thrusting frivolous elements. Just after Anushka comments on the prevalent patriarchy and vows to fight this provincial mind-set, the poignant scene cuts to Salman and her shaking a leg around a bunch of colourful extras to the beats of Lag Gaye 440 Volt. Ironically, Aarfa’s spirit is the first casualty in story and a rude reminder of how our films refuse to allow a woman to have it all. This trait of Sultan vexed me no end. It’s highly superficial in its ambition, as if the only objective is to tick off items on a list without bothering to check if appears authentic or heartfelt in the final scheme. It’s a story of two decorated wrestlers but their awfully rustic lifestyle suggests otherwise. Zafar cannot decide whether he wants to present his heroine as a feisty sports achiever or a dung cake smacking village belle. Also, no amount of rehearsed Haryanvi accent can conceal Salman and Anushka’s extra shiny stardom, which stands out out even more conspicuously around its believable supporting cast of Amit Sadh and Kumud Mishra. Consciously emotional in tone, Zafar creates some earnest moments around Sultan’s guilt and loathing when he breaks down over his out of shape physique. Warmth not attraction governs his chemistry with the much-younger Aarfa. Age is an impediment for Salman’s character but not rubbed in too harshly. Mostly it provides fodder for some humour when he challenges local blokes in a puerile game of collecting kites or just stops short of calling Aarfa’s father Bhai before settling on Uncle. Yet surprisingly, he doesn’t feel the need to acknowledge the growth in Sultan’s any other relationship besides Aarfa. Deep bonds are formed without the viewer getting a whiff and scenes of last-ditch reform are little more than consolation prize. The Rocky trace (the commercial scene tips its hat at Rocky II) is unmistakable and Zafar does try to emulate Balboa’s motto of 'not about hard you hit but how hard you can get hit and keep moving forward.' But at almost three hours running time, no thanks to a couple of completely needless songs, a spirited but spent Sultan slogs its way to knockout.